Background: Governments, funding bodies, institutions, and publishers have developed a number of strategies to encourage researchers to facilitate access to datasets. The rationale behind this approach is that this will bring a number of benefits and enable advances in healthcare and medicine by allowing the maximum returns from the investment in research, as well as reducing waste and promoting transparency. As this approach gains momentum, these data-sharing practices have implications for many kinds of research as they become standard practice across the world. 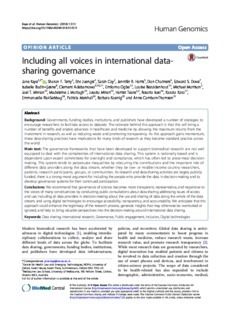 Main text: The governance frameworks that have been developed to support biomedical research are not well equipped to deal with the complexities of international data sharing. This system is nationally based and is dependent upon expert committees for oversight and compliance, which has often led to piece-meal decisionmaking. This system tends to perpetuate inequalities by obscuring the contributions and the important role of different data providers along the data stream, whether they be low- or middle-income country researchers, patients, research participants, groups, or communities. As research and data-sharing activities are largely publicly funded, there is a strong moral argument for including the people who provide the data in decision-making and to develop governance systems for their continued participation. Conclusions: We recommend that governance of science becomes more transparent, representative, and responsive to the voices of many constituencies by conducting public consultations about data-sharing addressing issues of access and use; including all data providers in decision-making about the use and sharing of data along the whole of the data stream; and using digital technologies to encourage accessibility, transparency, and accountability. We anticipate that this approach could enhance the legitimacy of the research process, generate insights that may otherwise be overlooked or ignored, and help to bring valuable perspectives into the decision-making around international data sharing.